The Sahara difficult? No it was easy, much easier than I thought it would be. Now parts of Tanzania, er yes parts of Tanzania have been hard. Hot, dry, arid and in some places windy, mostly blowing from the wrong direction oh and hilly. Whilst food and water stops are easy to find the riding has been much harder. Partly I think because my muscles are starting to feel a little fatigued and because West Africa was flatter I got out of shape (for hill climbing at least). I’m aware that a few days of hard riding that I used to shrug off easily at the moment seems to set me back a little, but getting out of the habit of pushing hard is even harder.. 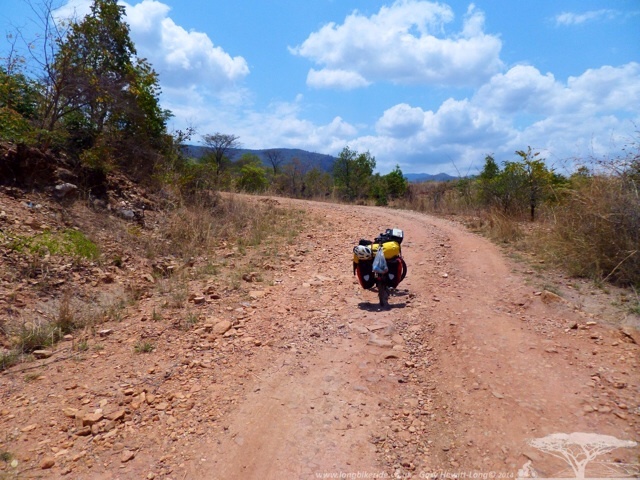 I was really starting to miss the colour green, when cycling from Iringa toward Mbeya, the route and scenery changes dramatically in a few miles. 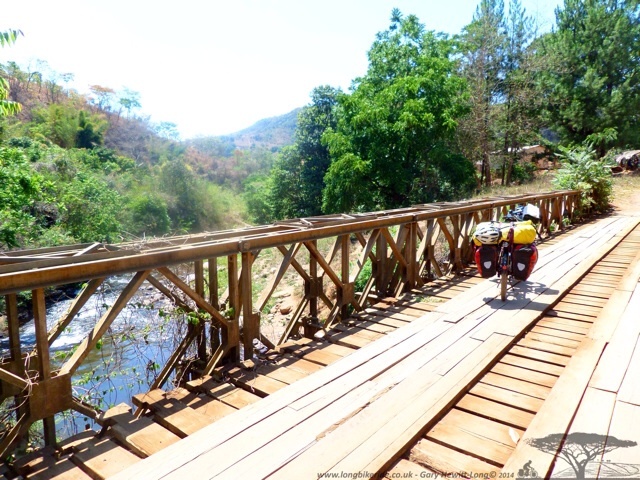 Dropping down from Iringa takes you through a beautiful green forest with areas of wetland and rivers, an oasis in the dry landscape. Green has a smell, life and vibrant and I’d been missing it for a while. 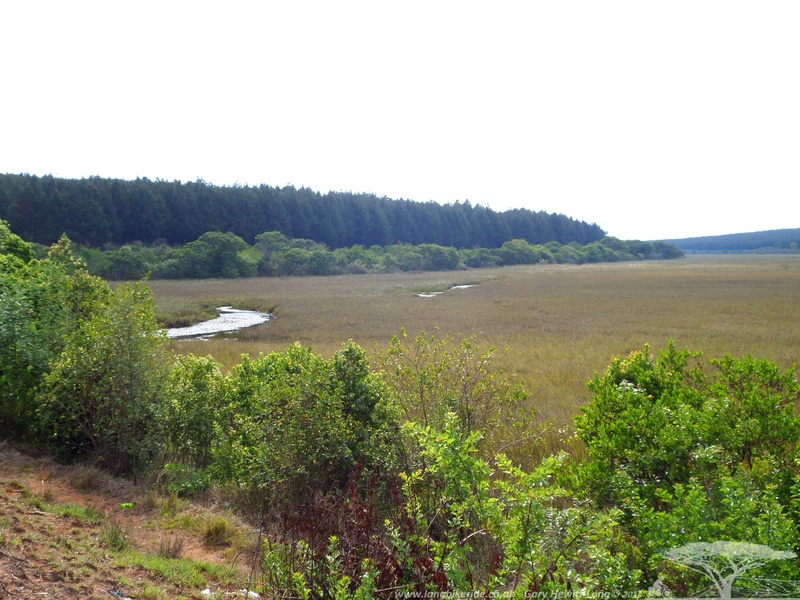 Riding through the forest for ten miles reinvigorated me and I didn’t want it to end. The forest would have made a wonderful wild camping spot, but as I didn’t know it was there I wasn’t carrying enough water to be able to take advantage. A bit of a shame. All too soon the elevation drops and back into the dry heat, descending further the heat increases, hotter and hotter. Descending into an oven. Regular breaks and stops are used to take on fluids and sustenance to fuel the journey. Increasingly more important as my stamina seems to be suffering (Cycling Stamina, not tested any other sort in a long while!). 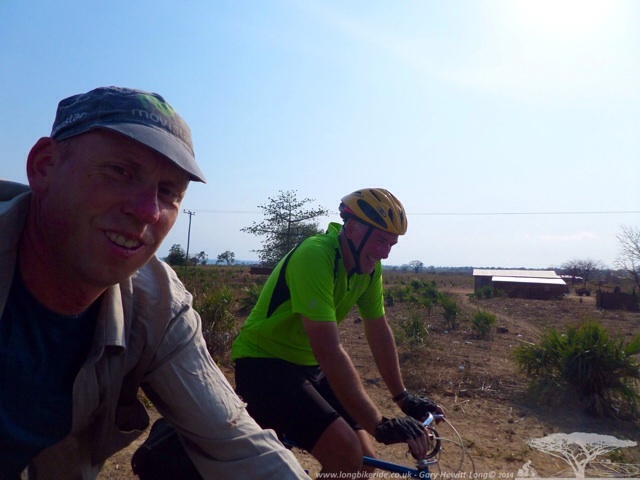 My target for a good rest stop was in Malawi, the Mushroom Farm that Gary and Jamie had told me about when I’d stopped in Karen near Nairobi. Entering Malawi was nice and simple. A few miles from the border the money changers start. The first one offering me 4.8 Tanzanian Shillings to the Malawian Kwacha. I had already checked what the rate should be officially and with the Malawian currency being weak was expecting a little better. After some negotiation, the changer dropped his rate to 4.5, then to 4.0 then we finally agreed on 3.8, happy (ish) with the rate I agreed to change half my Tanzanian shillings. As soon as the transaction was done the money changer was on the phone and low and behold 2 miles down the road a motorbike tries to pull me over to exchange my remaining currency as I stop to get a drink. Explaining that I have no interest to change the rest the changers warn that Tanzanian money is useless in Malawi and after having my passport stamped out of Tanzania there will be nowhere for me to change the rest of the currency, a story I seem to hear at most borders. Pulling up at the border control, exit of Tanzania and entry to Malawi is very simple, fill in a form, tell them I want 30 days and a stamp is in my passport to enter Malawi, very simple. Straight after the office there is a money exchange… who offer me 3.6 for my remaining currency! Oh Well, the earlier money changers made about £2 out of me. The notes are not worth a lot of money and you need several to pay for anything. 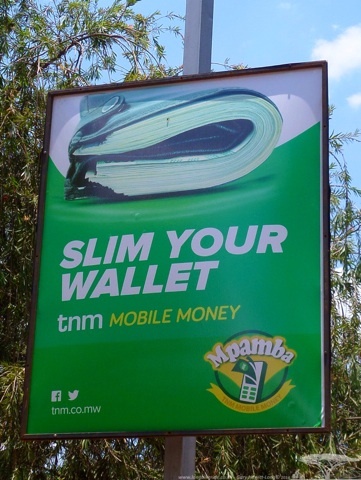 It looks like some people are recognising that the amount of money needed to pay for anything is becoming a problem, it’s physically impossible to fit the equivalent of £100 in your wallet, even using the largest notes available, 1,000 Kwacha. Maybe one day someone will print a 5,000 kwacha note. The ATM’s can only physically give out a maximum of 40,000, as much as will fit through the gap. 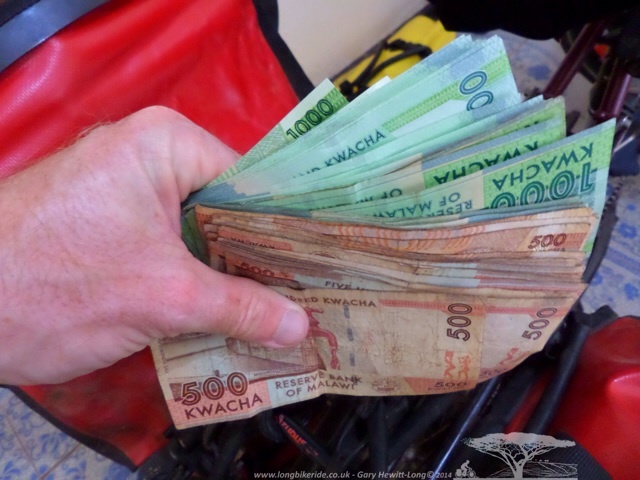 40,000 Kwacha is about £50. As ATM’s are few a far between then multiple withdrawals are made to get enough money. Riding into Malawi the main road is very busy, not with vehicles but people and people on bikes. 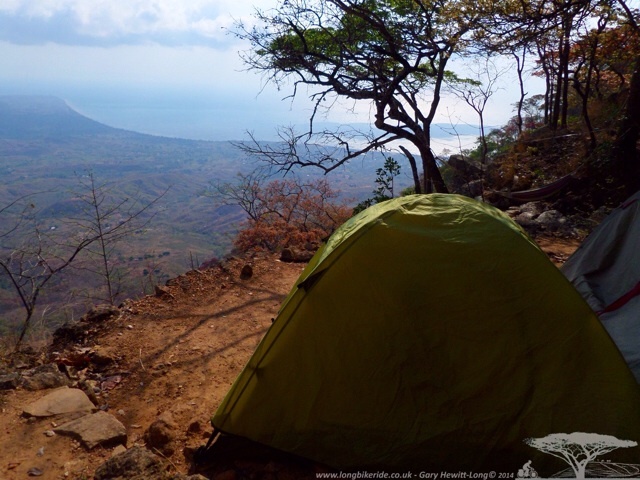 There seems to be nowhere to wild camp as there are people everywhere so I ride to Karonga and although not wanting to spend my first night in Malawi in a guest house I seem to have little choice after waiting for what seems an age to find a suitable camping location. Prices are more expensive than in Tanzania and the Guest House I stayed in was not as clean. It did come with a nice smelling big soap though, which I kept to wash my clothes with. Leaving early in the morning my target is the Mushroom Farm but the strong headwind off of the lake and the previous day’s high mileage had taken its toll. After 26 miles I see a sign for a campsite called Floja and decide I should call it a day. The headwind is strong and there is another 40 miles to the campsite including a big climb at the end. Ringing down to find out the rate and availability Jan (pronounced Yan) answers the phone and I am soon riding down the hill to the lakes edge. 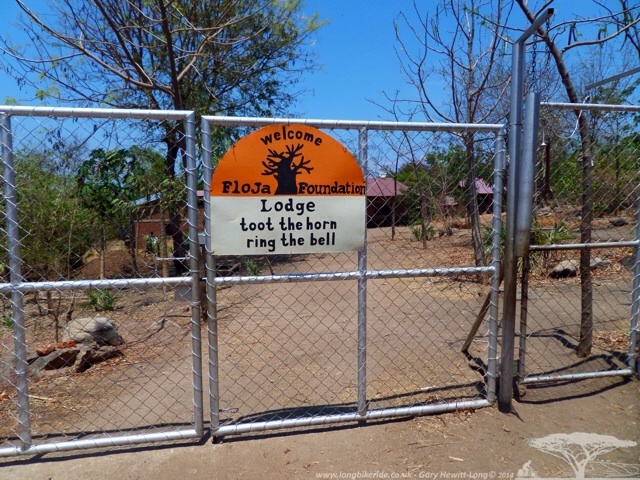 Jan and his wife have created a wonderful peaceful campsite and lodge next to the preschool they sponsor. 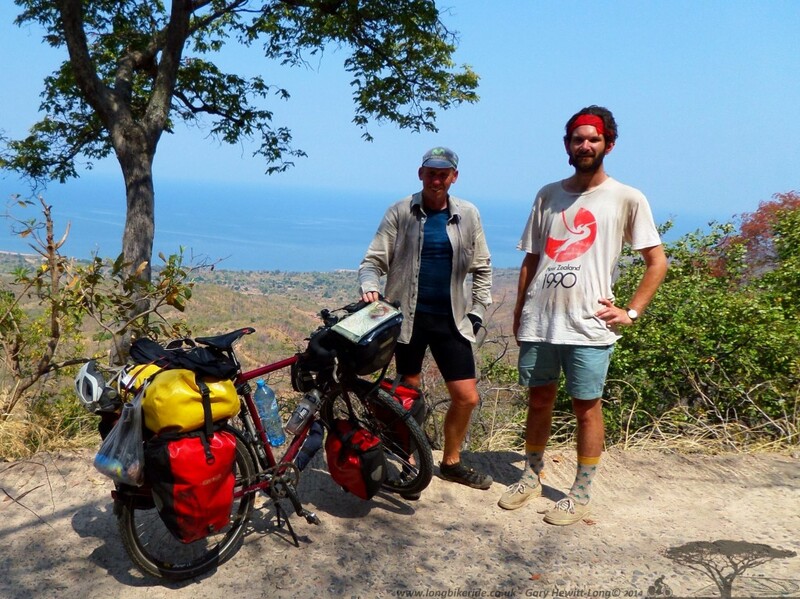 Simon is riding from Dar es Salam to Johannesburg on a wonderful old vintage Raleigh. 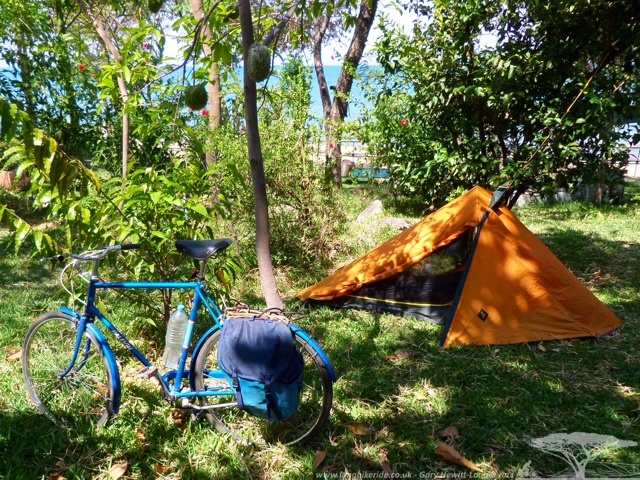 The campsite is right next to the lake, the water is lovely to swim in, just like the sea but with no salt. Surprisingly there are some large waves just like the sea and occasionally you see a shadow swim by, a fish or two. 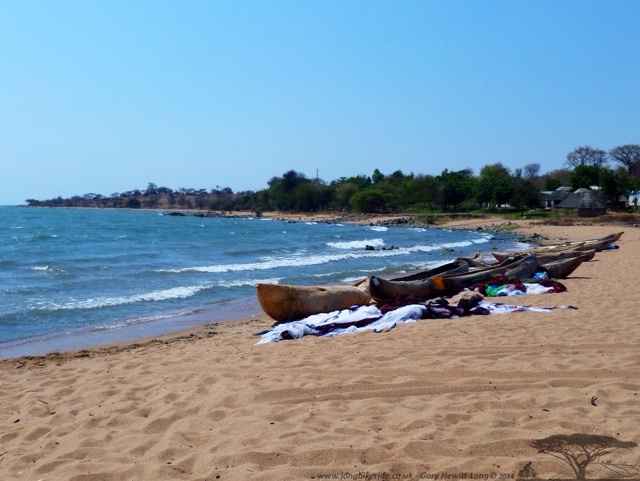 The lake is said to have Bilharzia in it, but Jan assures me that this part of the lake is OK as the water is moving and there are lots of rocks, not good conditions for the parasite. Local fisherman go out at night to catch Chamba, a small fish which they dry in the sun. 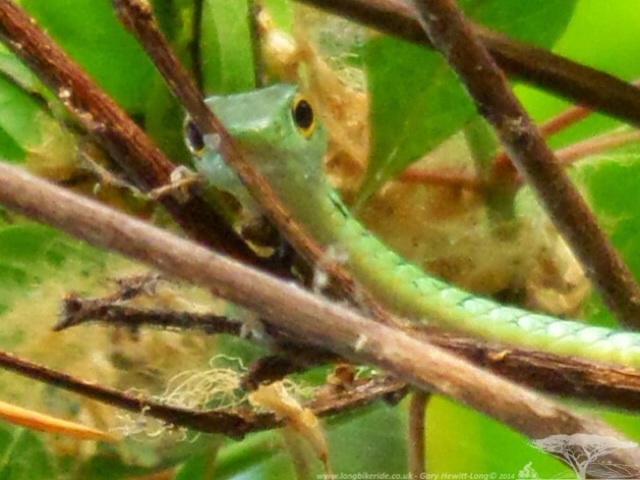 Jan called Simon and I over to take a look at a tree snake he had spotted. Enquiring further if there were many more snakes around the area, Jan confirms, “yes, too many!”, “Oh”, says I “Erm what sorts?”, “Black Mamba, Green Mamba, Spitting Cobra”, “Oh” Says I, “Wish I hadn’t asked”. I am not overly worried about Lions, Cheetahs, Leopards and Hyenas, but I am not overly keen on snakes. You don’t see them in the grass if you are walking and not paying attention and I like to wear flip flops when I am relaxing.. Luckily if you do get bit, only 50% of bites actually inject venom. 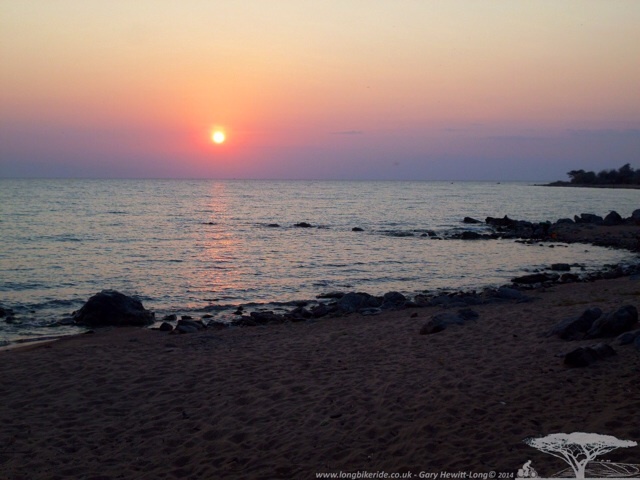 The sun doesn’t set over the lake in Malawi, but it does rise and wonderful it is too if you wake early enough. After a good days rest I feel relaxed and able to take on the headwind to the Mushroom Farm. 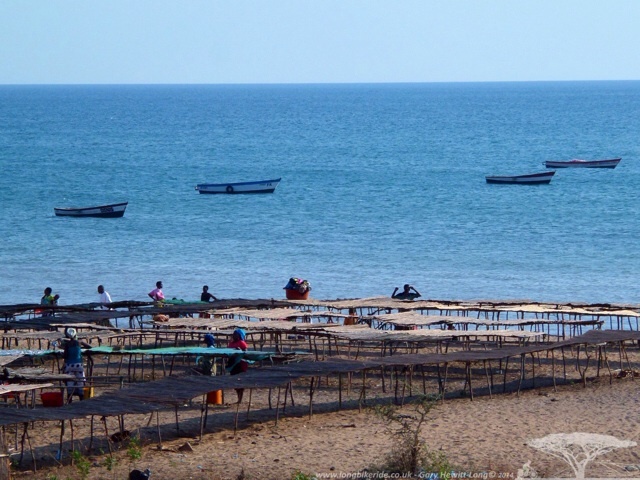 Just down the road from Floja, the boats have come in for the morning and the fish are laid out on the drying racks. The aroma of the drying fish can be quite strong and it seems that these little fish are everywhere being dried or in piles to be sold. Graded in size order for selling, the 1 inch fish are never with the 1.5 inch fish. A mile out of Chitamba a car pulls up and a nice young lady enquires if I am Gary, I confirm that I am and it’s Katie from the Mushroom Farm. She asks if I am leaving my stuff at the bottom at a campsite which will take care of it. I explain “No I have got this far, I will take it all to the Farm”. Taking the turning the road disappears and a gravel track starts. The incline rises to 22% and with the sand I physically cannot ride. The back wheel slips and I have to off to push. Shortly after a man comes walking up the hill who I recognise. 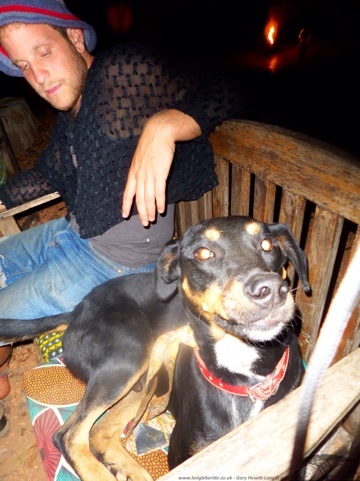 It’s Ian who I had met in Arusha at the Greenhouse hostel. He’s a welcome sight as someone to talk to will take my mind off the fact I have to push my bike 10km up a very steep hill with bad footing is just what I needed to keep my morale up. Thank you for the moral support Ian! It’s slow going and very hot, but as the climb continues and we get ever higher it starts to get cooler and there appears to be more trees and shade. Having Ian to talk to makes the climb much easier. After pushing the bike up the escarpment my legs are tight and tired, the day after my calves feel like they are on fire and ache, they prefer pedalling the bike and not pushing it. Luckily it was the first time that I had physically not been able to ride my bike and it’s not actually part of the intended route. On Tarmac the Rohloff gearing would normally get me up the toughest of climbs. Arriving at the farm I was greeted by the one of the owners Cameron and given a coke, it probably tasted the same as the all the other cokes I had tasted, but after the climb it seemed to taste oh so much better. The Mushroom farm is an Eco Camp set high up and on the edge of the escarpment. Having a few beers means you have to be a little careful, it’s easy to fall off the edge if you are not paying attention when you are a little inebriated. 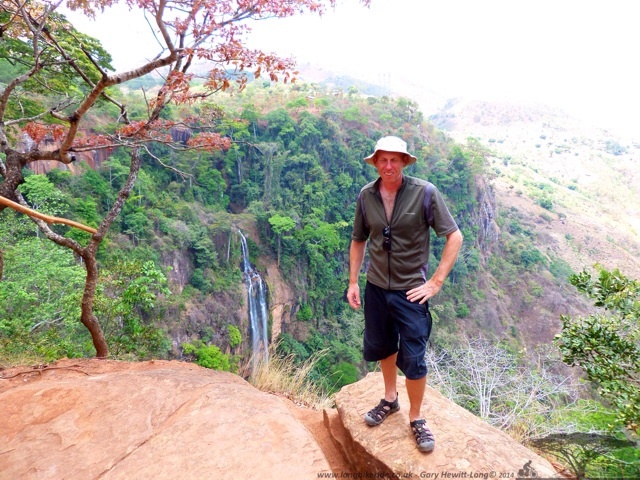 After a restful day on arrival Ian, Simon and I decided to go for a walk to Livingstonia and to visit the Mantchewe Falls. 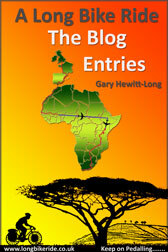 Entry to the falls is 500 Kwacha, what this pays for I am still a little unsure but it’s well worth the money. 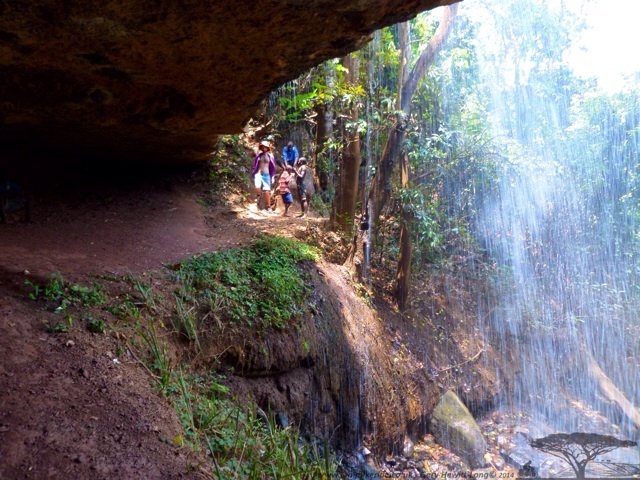 Walking down to the falls is shady, butterflies are fluttering around in the dappled light and as you approach the falls the sound of running water grows larger. Serene pools are at the top where you can cool your feet and watch the water cascade over the edge. We stop a while to take in the view before continuing further to see the falls again from a different angle. Simon and Ian bathing above the waterfall. It’s possible to get around the back of waterfall, where it’s really cool in both senses of the word. 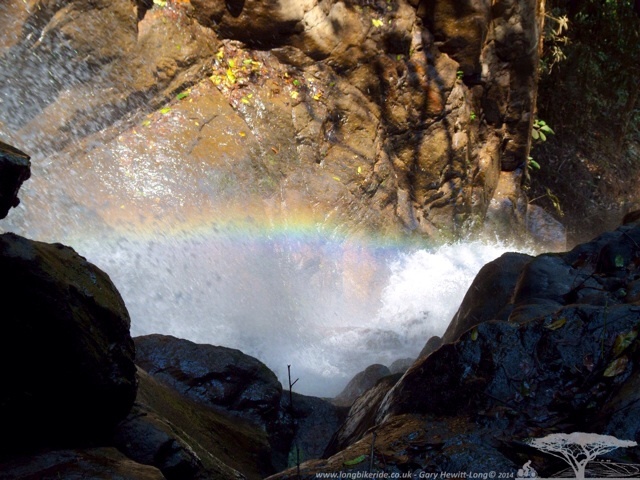 And you can see a wonderful rainbow as the water falls over the edge. Livingstonia the settlement founded in 1894 by the missionaries from the Free Church of Scotland, naming it after David Livingstone. The village is more of tourist attractions, the old colonial buildings still there, some making it look like an old part of England or to me. 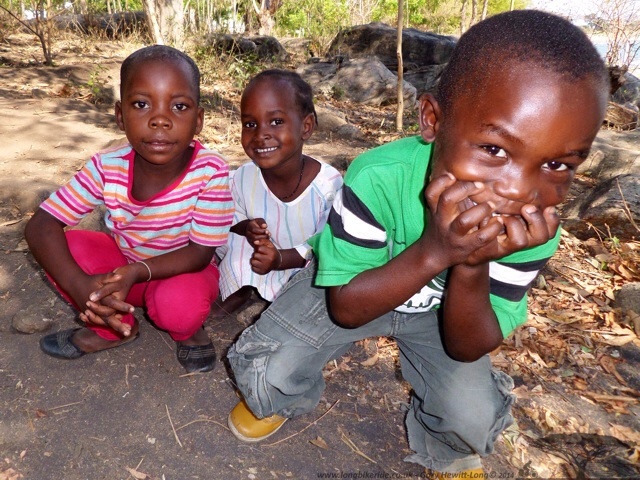 Apparently they fist set up closer to the lake at Cape Mclear and Bandawe, but after several deaths from Malaria they decided to move to higher ground where there are far fewer mosquitos. 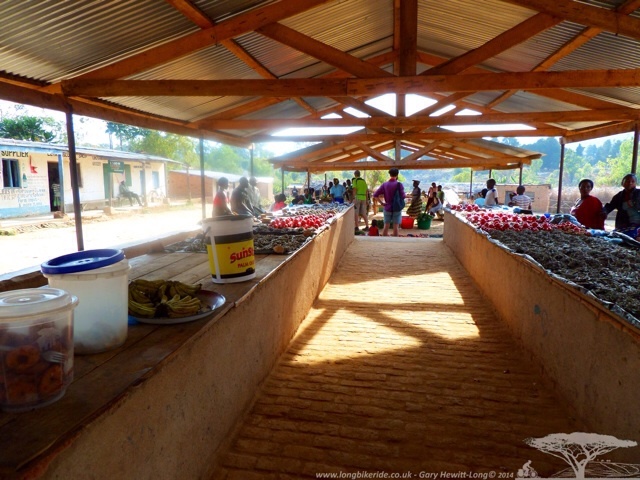 A locals market is held in the town every day with some limited choices of produce, dried fish (Chamba), potatoes, tomatoes and onions along with several types of bananas. There are small shops around the market selling bike spares, other nik naks and 3 barbers for some reason. During the time I was at Mushroom farm it was Halloween. Even the dog Chapatti got into the atmosphere. 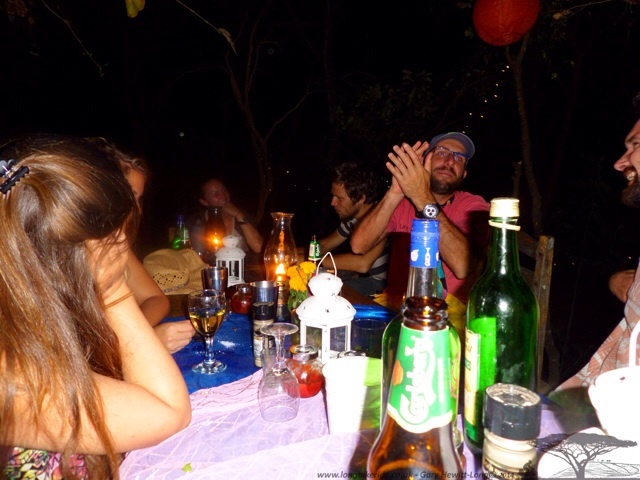 A Halloween meal was organised by the staff and some free wine and spirits were put on. The drink flowed rather too easily and before long the list of drinks tried had grown, beer (obviously), Crackling Wine, Sugar Cane Spirit, Apple Sour, Whiskey (Courtesy of Ian) and then to finish more sugar cane spirit but with apple sour mixed. I nearly fell off the cliff that night trying to find the toilet! After sleeping in the Cob House I moved into the dorm. 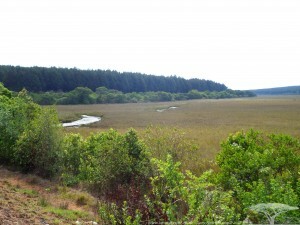 Most constructions at the farm are open to allow a great view and all have been constructed from sustainable materials. 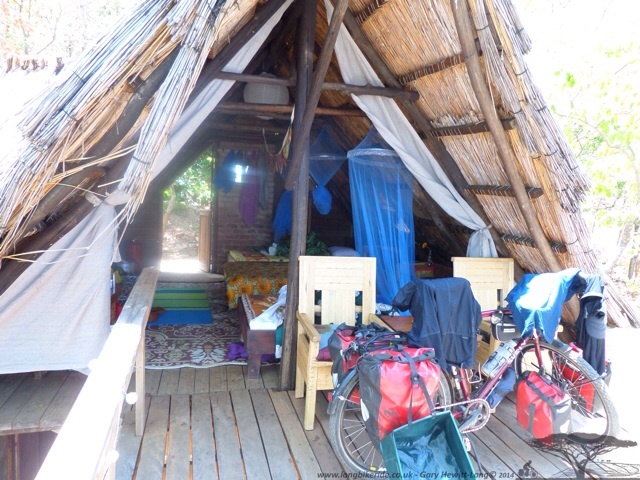 To start with there was no room in the dorm, so I took the Cob House, which happened to be the most expensive room on the property at £10 per night. I subsequently moved into the Dorm. 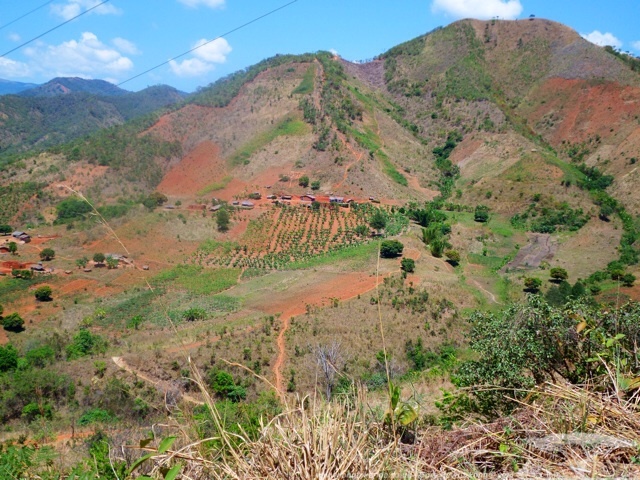 The scenery was breathtaking at times, with fantastic views of valleys and hills with green pastures, trees, forests and farms. After a short while I realised that there appeared to be much more climbing than I had expected. I persevered and after 15 miles it eased. Reaching my target of Mzuzu in the dark some 85 miles from Livingstonia, the GPS had the climbing at over 7,000 feet, approximately 3,000 more than ride with GPS website had it… It turned out to be the second highest amount of climbing in one day since I started the tour, almost matching the day I climbed into the mountains in Spain near Granada. My first choice of place to stay in Mzuzu was Joys Place a Korean hostel with apparently great Korean food. Phoning ahead a little late in the day it was full so I went to another hostel for the night. When I arrived at Moozoozoozoo hostel they said there was one other person there and when I went into the dorm there was a backpack there that I recognised. 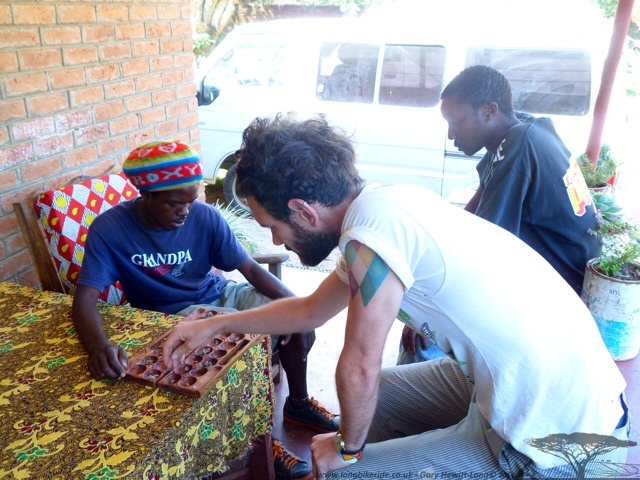 Ian’s from Arusha and Mushroom Farm. 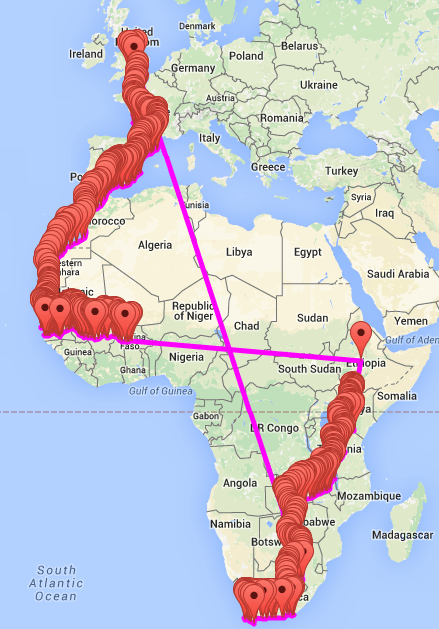 My intended route was to go to Mzuzu then on toward Lilongwe. 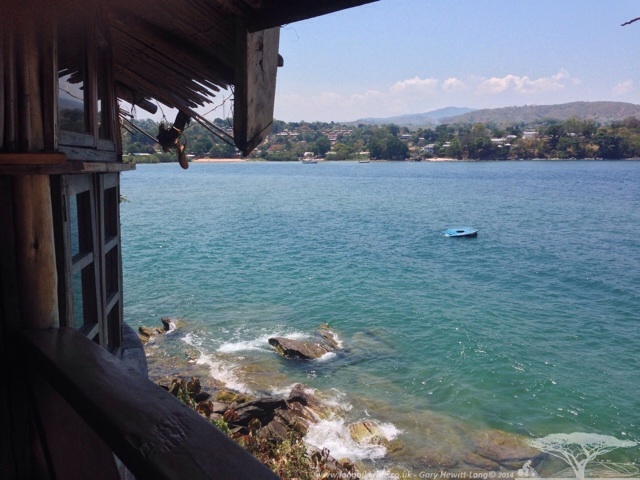 After looking at the route and speaking to some other people I decided to take a route change to Nkhata Bay for a day or two. It’s nearly all downhill anyway to the lake. 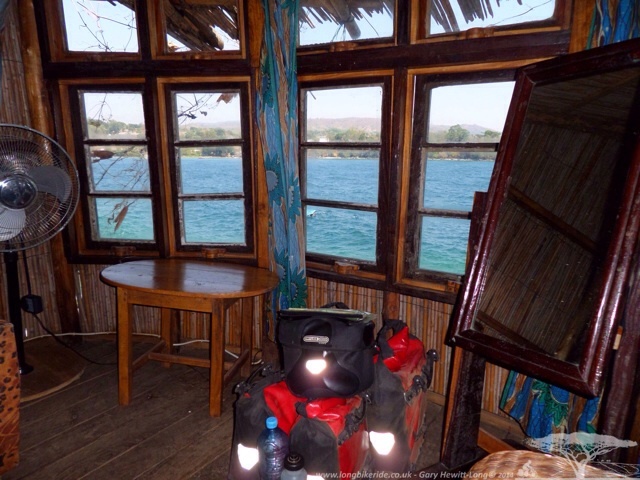 I decided to leave some of my kit at Joy’s the next morning with the plan to go back on the Thursday or Friday, this lowered the weight of my bike for the climb back up the lake after Nkhata Bay, leaving behind my tent, cooking equipment and some bike spares that I shouldn’t have needed. During the night some idiot locked us in the dorm from the outside. As I needed to use the toilet and there was no way out, I decided to climb out window and shimmy round, firstly to the left, no way round, then the right, no way round, only a drop of 20 feet if I put a foot wrong. I managed to ask someone walking by to let me out. Very dangerous, enough for me to not want to stay a second night in the dorm. I moved into a chalet for the next night, the price was not a lot more but oh.. the view was so much better and no chance of being locked in! It looked out onto the lake and the sunbathing area. Led on the bed you could see the lake lit by the moon and hear the waves breaking on the rocks below. 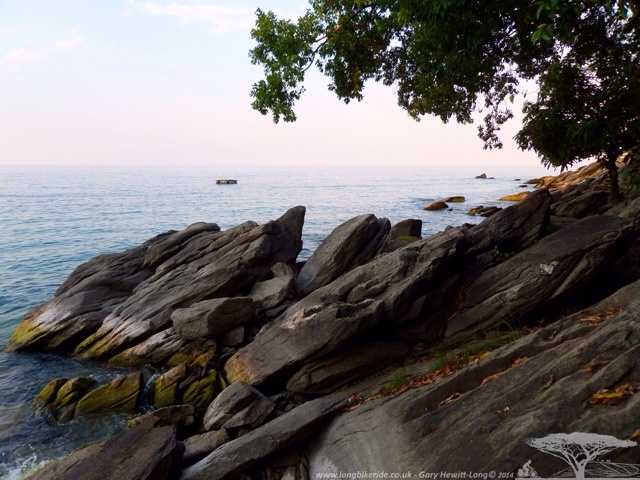 The water at the lake was a beautiful blue colour and the rocks with a bright green bloom on them. 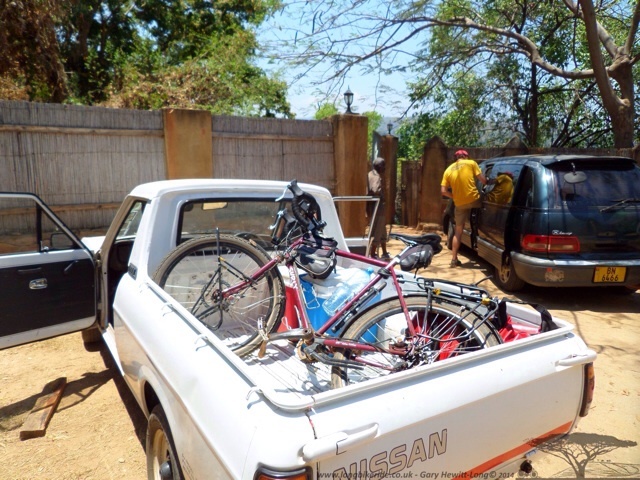 During my stay at the Myoka Village I had left my bike locked to a post. As soon as I arrived I washed my clothes with my cycle computer in the pocket, but realised just in time. I put it back on the bike to dry and forgot to get it later; unfortunately later someone else had decided to take it, losing my second cycle computer so far on the trip. Jeandre one of the guys who worked at Myoka was heading to Mzuzu to buy stock for the resort, I managed to cadge a lift in his pickup to save me riding back up the hill. As I had ridden down the hill, the idea of riding back along the route wasn’t that appealing so I took the opportunity of a lift.